Mark's Dog Blog: What Would You Do? As part of my business, I offer clients pet transportation services - Pet Taxi, if you will. If they are unable, I transport their pets to and from vet or grooming appointments. One of my most senior clients is 88 years old. Her dog, Moby - not his real name - joins my playgroup a few times a week, and since the client is always home, I get to spend a few minutes chatting with her each time I pick up or drop off the dog. What I've come to realize is that Moby's owner is very sweet, but very forgetful. Sometimes she inquires about my day, asking, "Are you busy today?' After giving her a short explanation about what I have to do, she usually follows up with, "Are you busy today?" After two or three of these repeats, I usually just head for the door shouting, "I'll see you next time - goodbye!" A few weeks ago, she asked me if I would be able to take Moby to the groomer's. I agreed, and so the appointment was made. A few days later, I went to her house to pick up the dog. I rang the doorbell. The dog barked. She yelled, "COME IN!" I walked into the hallway, then heard her call out, "I'm in the kitchen." I went into the kitchen, and there she was, sitting at the large table with four white envelopes in front of her. "I've got everything sorted for you," she told me. "These are yours." She handed me two of the envelopes. "And these are for Jennifer," the groomer she had been using for almost ten years. Another two envelopes for her, as well. I began to ask the reason for all the envelopes, but she beat me to it. She explained that one was payment for service and the other was a tip. She did seem to have it all sorted. I was about to leave, but she stopped me. She took my face into her hands and said, "You don't know how much this means to an old lady like me. I would have no other way of doing this. You're an angel." See - I told you she was sweet. On the drive to the groomer's, I was thinking, "When I get older, I hope I'm as nice as her." But I doubt it. 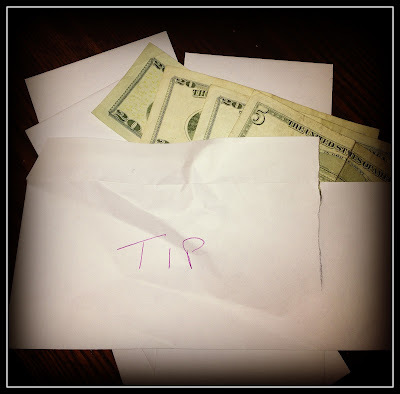 I was also curious to see how much of a tip she gave me, so at the first red light, I opened the envelope with TIP written on it. $25.00 in cash. "WOW! That's a good tip," I thought to myself. Then I looked at the other envelope - it too had TIP written on it. Oh! Maybe the $25.00 was supposed to be for the groomer. I decided to open the other envelope - $25.00, as well. So it was not a mistake, she really was being generous. I proceeded to open the envelope with my name on it. $25.00 again. I wasn't as happy now, since I charge $35.00 for this service. I thought to myself, "Hey, she just gave me a $25.00 tip, so it's not a problem." I was still coming out ahead. I looked down at the last envelope. It looked skinny. Like there was nothing in it. I held it up to the light. NOTHING. NOTHING. It was very obvious there was NOTHING in the envelope. I opened it, hoping to be wrong. But no, it was empty - very empty. I had opened all the envelopes, and there was a total of $75.00. Moby is not a small dog, and I go to the groomer's enough to know that $75.00 is not going to cover his new hairdo. So I got to the groomer's. I opened the door, and Jennifer yelled, "MOBY!!" They obviously knew each other. She prepared to start working on Moby and said that she would call me when he was done and I could come pick the dog up. I asked how much it was going to cost, and she said, "it's normally $95.00 for a dog like Moby, but as his owner is a really nice customer who has been coming here for years, I only charge her $75.00." In this instance, I would try to get in touch with a family member or care giver and explain the situation. The lady does not need to be living alone if she's in this condition. She could become a danger to herself and possibly her neighbors by leaving the gas on or not taking meds on time....She could also become a danger, sadly to her dog. You owe it to her as a human being to find someone to help her....and you could possibly get your $35 in the process.